This may sound strange to some of you ,but I have close relationships with a few of my books. They have become friends, companions who comfort me during hard times. The familiar words offer solace when the world feels unfriendly and confusing. Today's picture book explores the relationship that one little boy has with a book, and readers will be intrigued to see that the story does not, perhaps, turn out the way they it would. There once was a good little book that rested on a shelf in a study alongside many other books. Unlike many of the other books, the good little book did not have a flashy cover, nor had it been awarded medals. It was just a modest little book. One day a boy came into the study, and he was not in a very good mood. He was in trouble and had been told to “think things over.” The boy did this, for the briefest of times, and then he started to look around the study. He found the good little book, opened it, and started to read. In no time at all the boy was swept up by the narrative in the book, and he barely noticed time passing. He read the book from cover to cover and then read it all over again. All through winter the boy went about his days with the good little book as his “loyal companion.” In spring the special connection between the book and its boy kept going, until one terrible day when the book fell out of the boy’s backpack and was lost. The boy was so worried about the book and spent hours looking for it. 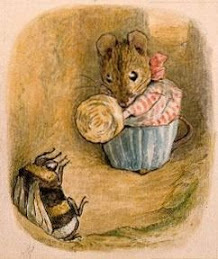 The boy was concerned that the book, which “did not have the skills that would help it in the dangerous wild or in the rushing streets,” would not be able to survive. The boy asked people for help, he put up lost book posters, and he searched the library; all to no avail. What he did not know was that the good little book was coping quite well, considering that it was small, unassuming, and helpless. This wonderful picture book beautifully captures the way in which a person can have a special relationship with a book. It also celebrates the way in which a book lives on within the hearts and minds of its readers, long after it has gone out into the world to find new readers. School is about to start, or has just started, for children all over the world. Now that a new school year is here, somehow it seems very appropriate to post my review of Neon Aliens Ate my Homework and other poems. After all, it won't be long before the homework blues will start, when children will be wishing that they could find a handy alien to conveniently 'eat' their not-yet-done homework assignments. Many of us love new gadgets. We want the newest phone, the newest computer tablet, the newest e-reader that has all the most up-to-date bells and whistles. We get so caught up in the new tech buzz that we forget that sometimes new technologies make our lives more complicated. Sometimes they even get in the way of things that make our lives happier and richer. In this second Tweedles book, Monica Kulling brings back the wonderful family whose members are living in a time when new technologies are around every corner. Seeing how they cope with these technologies is amusing, and their experiences also serve as a reminder that we need to control our gadgets and not be controlled by them. One day Mama is preparing to make pickles when her neighbor, Gladys Hamm, comes rushing in and she is in a very excited state. With great pride Glays tells Mama that she now has a telephone installed at her house. She uses the newfangled device to order her groceries and to talk to her sister whenever she wants to. That evening Mama announces that the Tweedles are “going online;” they are going to get a telephone. Her daughter Franny is delighted, but her husband and son are less sure about the wisdom of getting a phone. Frankie is far too interested in taking care of the family’s electric car to care about a telephone, which cannot even be driven. Papa doesn’t like the idea that people will be able to hear his conversations. The idea of a telephone, with its lack of privacy, does not appeal to him at all. Soon enough the telephone is installed in the hall. When it rings for the first time fearless Franny answers it and then her mother talks to Gladys. She talks to her for so long that when she hangs up everyone else is the family has gone to bed. It soon becomes clear that the telephone may not be such a wonderful idea after all. Even Franny, who has wanted a phone for a while, begins to see that the machine might be more of a nuisance than a convenience. It is all too easy to become more than a little addicted to new and interesting technological devices. The problem is that they can take over our lives and cause us to miss out on the things in life that really do matter. With humor and sensitivity, Monica Kulling explores how one family copes when a new telephone is brought into their household. As the story unfolds, readers can see the writing on the wall, but they cannot be sure how the Tweedles are going to respond to this new technological crisis. These days many of us take artificial lights for granted. It is only when the power goes out that we realize what it is like not to have lights turn on at the flick of a switch. Here in southern Oregon we have been sitting under a pall of wildfire smoke for several weeks now, and though we still have electric lights, the sun is a pale hazy thing in the smokey sky, and often we cannot see the moon and stars at all. I miss nature's lights, which make our world such a beautiful place. Today's poetry title celebrates lights of all kinds and I think I will go and light a candle now, to add a touch of bright sunshine to this room. Light, in its many forms, has a huge impact on our lives. The sun’s light greets us in the morning, and on many nights moonlight sends us off to bed. Under the covers children read another chapter of their new book by flashlight, while the flickering lights of fireflies dance in the darkness outdoors. In this unique poetry collection the author explores the many ways in which light touches us as we go about our days and nights. The poems are concrete poems, which means that the words are arranged on the page in such a way that they create a picture. In Cresent Moon, we see a simple poem smiling out at us from the page, a thin sliver of yellow in the night sky, and in Birthday Candles the words are arranged so that they look like a birthday cake, complete with four candles. The words that serve as the candles on the cake form the phrase “Happy Day” (twice) and the icing words describe how the candles are “Like shooting stars / that blaze the dark.” Even when the candles have been blown out the light from the faces “circled near” is still there. Other topics covered in these poems include the sun, a firefly, a match, a lightning bolt, a light bulb, a porch light, stars and the full moon, a spotlight, the light inside a fridge, a lighthouse light, and a lamp. Children will enjoy seeing how a poem can titillate both their eyes and their eyes, and they might even be inspired to write a light-filled concrete poem of their own. Jon Muth is an author and illustrator whose work is so beautiful and powerful that I feel very humbled every time I get to experience one of his creations. Today's picture book title is the third of his Zen books, and once again Stillwater the panda bear features in the narrative. Leo and Molly love living in their neighbourhood, and one of the reasons why they like living where they do is because Stillwater lives across the road. Stillwater is a panda bear and he is a gentle, kind, and wise friend. One day Molly invites Stillwater to come outside to dance with her, and soon she and the bear, both clad in tutus, are happily doing ballet on the front lawn. Molly plans on becoming a ballet dancer like her aunt, and she will get her dream by practicing all day. She tells Stillwater how she will become famous and will “get flowers and lots of blue ribbons and tiaras and my name will be on posters with lots of glitter!” Stillwater suggests that it might take some time to attain this dream, but Molly is in a hurry to get the skill and fame she seeks. Stillwater then tells Molly a story about a young fellow called Jiro who wants to become a great swordsman like his father; so Jiro goes to see Banzo, the master swordsman, to learn from him. Jiro is impatient and eager to learn as fast as he can but instead of teaching him swordsmanship, Banzo makes Jiro work all day doing chores. Only after three years have passed does Banzo start to teach Jiro the skills he needs to have to wield a sword. Molly understands what Stillwater’s story means. She needs to practice diligently for “as long as it takes.” She must not rush a process that requires both hard work and patience. This lesson in patience is only one of many things that Molly and Leo learn from Stillwater. Through his actions and his stories, Stillwater helps the children understand that the root to happiness is not about getting “all the best things for ourselves.” They also come to see that we must keep doing the right and kind thing, even when it looks as if our actions seem inadequate in a world full of problems. In this, his third, Zen book, Jon, J. Muth helps us see how little life experiences can help us learn about the world and each other. Wisdom is there for us to find if we just take the time to look around and open our eyes. When I was young some of the first poems I got to know well were Edward Lear's limericks. Limericks are funny, easy to learn poems that children cannot help liking; and since they are short, they also are fun to write. What do you get when you combine a short rhyming poem with a joke? A limerick. These five line poems always have a rhythm, and the words at the ends of the first, second and last lines always rhyme. Though they are short, these amusing poems always tell a story of some kind that end with a ‘punchline’ that make readers smile, laugh…or groan. The author of this engaging book begins by offering his readers a description of what a limerick is and how such poems are constructed. In fact he walks us through the process, explaining what the “rules” of limericks are so that readers can write their own. He wraps up by reminding us that we should “have fun” when we are creating limericks. We then get to see for ourselves how much fun limericks are because the rest of the book is full of these laughter-filled poems. They all tell a humorous little story, and the closing line in each one will certainly put a smile on every reader’s face. This book is one in a series of titles about the many forms that poems can take. The first day of school, especially ones first day of school ever, can be a little scary. Figuring out what the rules are, learning where everything is, and getting along with children one has never met before is challenging. In today's picture book you will meet a little girl who is dinosaur mad, and who expects everyone else to be as dinosaur mad as she is. The problem is that the other children in her new class have other interests and therefore the point of connection that she expects to have with them just isn't there. One morning, bright and early, a mother comes into her daughter’s room to wake up her up. It is the first day of school and she doesn’t want Ally to be late. Ally, from under her covers, tells her mother that her name is Ally-saurus. When she gets dressed, Ally-saurus puts her pants on backwards so that her “dinosaur tail can stick out,” but Father makes the little girl put them on the right way round. When Ally-saurus gets to school she tells her new teacher to call her Ally-saurus rather than just plain old Ally. At every opportunity during the morning Ally-saurus talks about dinosaurs. She eats like a dinosaur at snack time, her nameplate for her cubby is dinosaur shaped, and when they talk about the weather she says that a cloud looks like a dinosaur. She even says that the word dinosaur begins with an A even though she knows perfectly well that the word begins with a D. Ally-saurus just loves dinosaurs, but it turns out that not everyone does. Tina and her two friends like princesses not dinosaurs, and it isn’t long before Ally-saurus starts to wish that she was back at home eating lunch with her toy dinosaurs. This delightful picture book celebrates the power of a child’s imagination. It also explores the way in which children learn how to accept each other’s differences, and how those differences make our lives richer and happier in the long run. Children will also appreciate seeing the way in which Ally-saurus and the other children manage on their first day of school. The arrival of a new baby is an exciting and often a somewhat chaotic time. Schedules are turned upside down as the new member of the family makes his or her needs known to all, and yet, of course, the baby is treasured and loved. Today's poetry title is a celebration of that new family member and most of the poems are told through the eyes of infants. When a new baby arrives in a household, parents are usually overwhelmed with joy and confusion. There is so much to learn about how to care for the baby - this little person who seemingly came out of nowhere to fill their lives with so many experiences and emotions. In this very special picture book Sharon Creech celebrates the arrival of a new baby. Her poems are so musical and lyrical that when they are read they are like a lullaby, a song just for a baby to listen to. This is the kind of poetry book that grownups will love to share with the new baby in their life. It was certainly written for babies and toddlers but it also feels as if was written for the grownups as well. At some point almost everyone decides that they wish that they were different or like someone else. They wish they had curly hair, that they were taller, that they were rich, that they were athletic, that they were.... On and on it goes. In today's picture book you will meet a frog who wishes he were something else. He does not realize, at first, that being a frog might have its advantages. 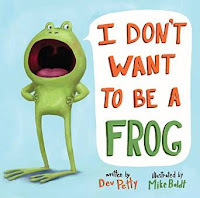 The young frog goes on to say that he would like to be a pig or an owl, and the father frog patiently explains why a frog simply cannot be these animals. Then a wolf comes along and he asks why the young frog is “so glum,” and the young frog explains why it wishes it could be a cat, rabbit, pig, or owl. They wolf responds by helping the frog to see that being a frog might have its disadvantage, but when a wolf is in the neighborhood it is a very good thing to be. All too often we wish we were something else. Being who we are is boring and not very interesting, and surely being someone else would be better. In this clever and deliciously funny picture book the author and illustrator show to great effect that sometimes the best thing to do is to embrace who you are right now. Others may seem to have a better life than you do, but they might not be as well off as they seem.